Mercedes has been rethinking model designations and in a midlife facelift exercise, has now replaced the SLK with the SLC. Along with the name change, out too, is the naturally-aspirated V8 engine found in the SLK55, replaced with a Biturbo-charged V6. 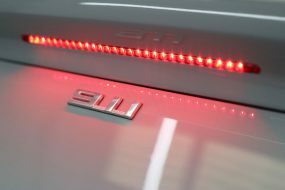 Although Biturbo and twin-turbo both represent a dual turbo mechanism, the setup differs from a more common sequential twin charger configuration. With sequential twin turbochargers, there is a smaller turbo fitted in front of a larger turbo. The idea is for the smaller turbo to spool at lower pressures until enough airflow is generated to spool the larger turbo. This set up reduces ‘turbo lag’ – the dead time between the request for increased power and the delivery of it. With a Mercedes Biturbo configuration, the turbos are placed on either side of the engine and each delivers power only to their side of the engine only. As they work in parallel with each other, power is delivered more quickly and efficiently. For the Mercedes-AMG SLC 43, the 3-litre engine produces 362bhp between 5500 and 6000 rpm and delivers peak torque (420lb ft) from 2000rpm through to 4200rpm. Top speed has been limited to 155mph and 0-62mph takes a modest 4.7 seconds. The SLC 43 is delivered with Dynamic Select as standard, allowing the driver to select from five distinct driving modes: Comfort, Sport, Sport+, Eco and Individual. 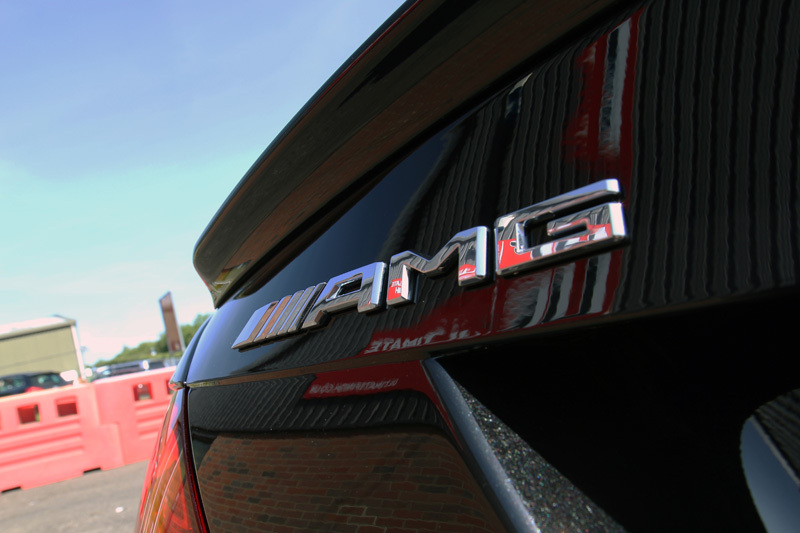 The brake kit is an AMG upgrade too, speed sensitive steering and a sports exhaust system. Although the body shape retains the essential SLK look, various features of the SLC have been revamped, redesigned or tweaked. The metal folding roof mechanism has benefitted from a re-think and can now be deployed or stowed at speeds of up to 25 mph. A steeper angled front grille exaggerates the arrowhead shape of the bonnet enhancing the impression of motion while the front bumper now has extended air intakes for improved engine cooling. Headlamps have integrated LED daytime running lights and revamped internal graphics. The rear bumper has been restyled and LED tail light graphics have been incorporated. 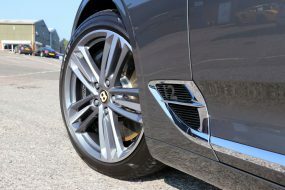 Unique to the AMG SLC 43 is the styling kit (front splitter, deeper side sills, rear spoiler and diffuser), along with 10-spoke 18-inch alloy wheels. 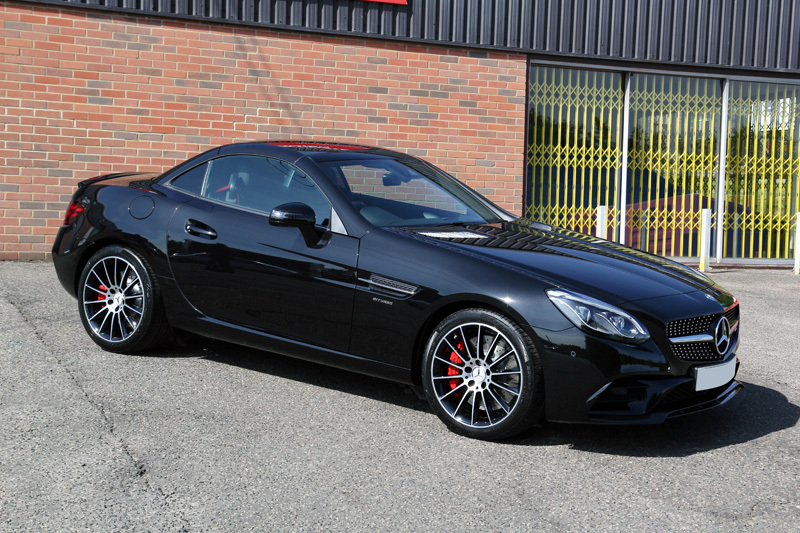 This Mercedes-AMG SLC 43 belongs to a well-known and popular British actor who, appreciating the value of his new purchase, wanted it protected properly, right from the start. 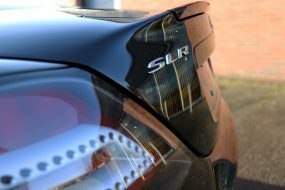 Following a consultation with UF, the SLC 43 was booked in for a New Car Protection Treatment with an upgrade to the ‘Gold’ sealant option; Gtechniq Crystal Serum Black. Gtechniq Crystal Serum Black is a two-step system incorporating their latest nanotechnology-based coatings: Crystal Serum and EXO v3 Ultra Durable Hydrophobic Coating. Although applied as a single layer, Crystal Serum provides an exceptionally durable, swirl-resistant barrier by curing as two component layers: the lower layer cures to a hardness of around 7H (on the pencil scale of hardness). This lends flexibility to the coating. The upper layer cures much harder, to around 9H. The combination of hardness and flexibility allows the coating to better withstand swirls – the leading cause of tired and dull looking paintwork. 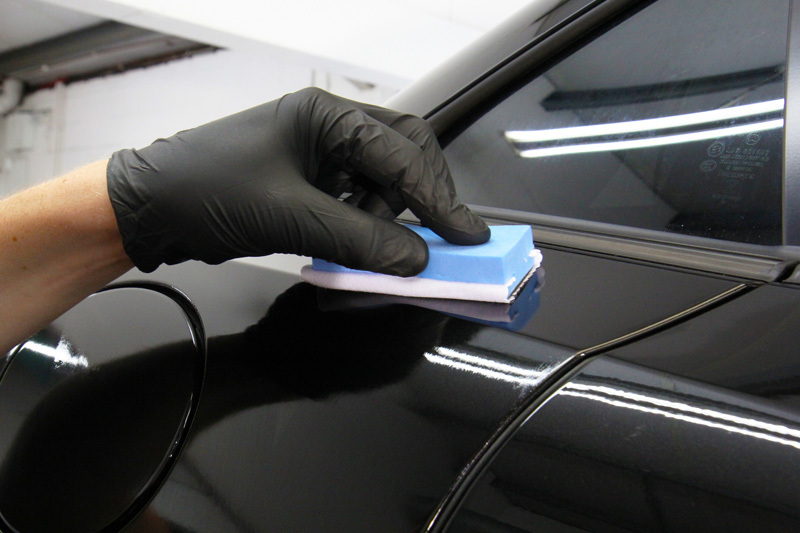 To enhance the gloss and hydrophobicity, a layer of Gtechniq’s new EXO v3 Ultra Durable Hydrophobic Coating is applied. An organic-based formula, EXO v3 cures harder (than hybrid or non-organic formulas) and has remarkable anti-water spotting capability. Combining Crystal Serum with EXO v3, delivers a stunning gloss and a water, dirt and oil repelling surface virtually impervious to extremes of pH. To achieve maximum potential, Crystal Serum must be applied in tightly controlled environmental conditions and as a result, this coating is available as a service only through Gtechniq-approved detailers. Once applied, performance is manufacturer-guaranteed for seven years! 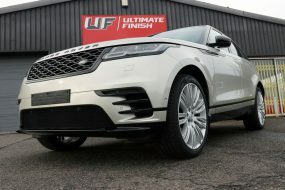 The car was delivered by trailer to UF’s Brands Hatch Detailing Studio direct from the dealership and so still had the identifying marks and transportation films in place. 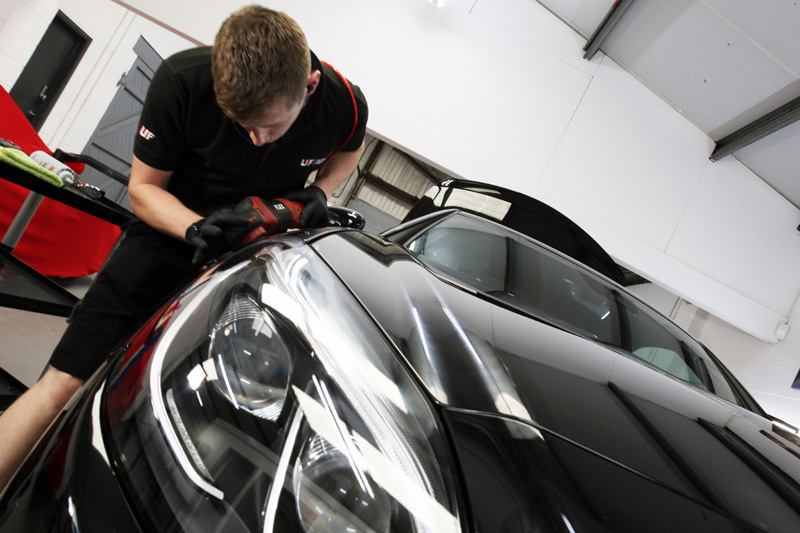 Before the paintwork can be protected it must first be thoroughly decontaminated and cleaned. Decontamination processes, therefore, include treatment for iron particles, oily residues, environmental organic elements such as bird droppings and tree sap, and inorganic elements such as road tar. Each type of contamination has a product designed to tackle it using non-contact methods, the better to protect paintwork from becoming marked or swirled. First, the SLC 43 was treated with Gtechniq W6 Iron & General Fallout Remover. Iron particles attach themselves to substrates having been shaved off brake pads when brakes are applied. Hot, they quickly bond and washing alone is an ineffective method of removing them. If they do become dislodged their sharp profile can scratch the paintwork. The active ingredient within W7 changes colour on contact with iron particles and works to shrink them, forcing them to break the bond they’ve formed. When the colour no longer deepens, the solution and the contamination can be easily rinsed away. Next, the car was treated for oily residues and diesel splatters as left in situ, both can cause staining and interfere with the bonding process of the final sealant. Gtechniq W5 Citrus All Purpose Cleaner was used on the bodywork, wheels and wheel arches to ensure they were thoroughly degreased. Surfaces were treated for sticky residues of transportation wax and tar deposits using Gtechniq W7 Tar & Glue Remover, designed to dissolve these types of adhesives. Bug remains were tackled with an application of W8 Bug Remover. Finally, the vehicle was pre-cleaned using Ultimate Snow Foam to remove any remaining larger particles of dirt and grit. The SLC 43 was then washed using the Two Bucket Method, where separate buckets with Grit Guards in the bottom are used for wash and rinse waters. This helps prevent the reintroduction of dirt and grit back onto the paintwork. An Ulti-Mitt Double Sided Merino Wash Mitt was used, the soft natural wool sweeping dirt off the panels and entrapping it deep into the pile. The shampoo selected was Gtechniq G-Wash, a pure shampoo that rinses clean away without leaving residues. Once the car was clean, the suds were rinsed away before an Aqua Gleam De-ionising Water Filter was attached in-line with the hose to deliver a final, pure water rinse. The SLC 43 was brought inside the studio, dried with soft microfibre towels and then, using an air blower, water was forced out of all the natural trap areas. This is vital as any moisture released later will interfere with the application of the coating. 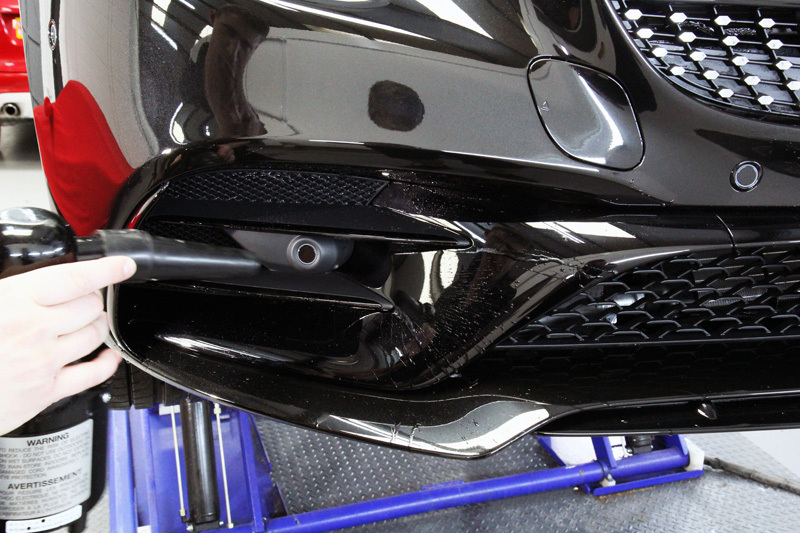 The condition of the paintwork was inspected using a SCANGRIP Sunmatch 2 detailing light. This high-intensity lamp reveals the extent of paintwork swirls or scratches. Any present need eliminating prior to applying the protective coating as, once the coating is in place, the marks will be permanently sealed beneath and cannot be removed. 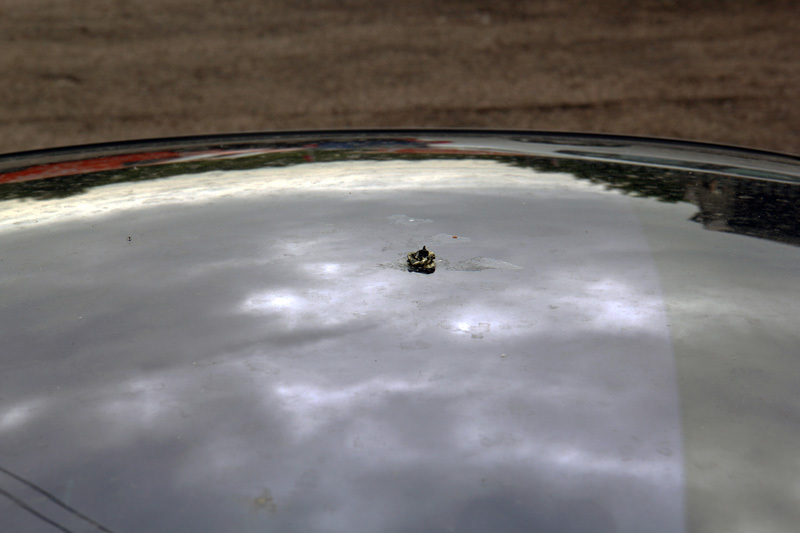 In this instance, the paintwork was in generally good condition. There was a small area where bird lime had begun to etch into the clearcoat. This was tended to using Menzerna Heavy Cut Compound 400 and a Flexipads Microfibre One Pad on a RUPES BigFoot Mini LHR 75E Dual Action Polisher. 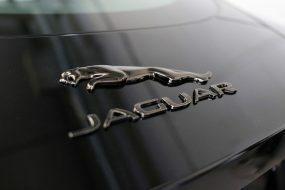 This allowed a controlled build-up of heat, encouraging the clearcoat to swell slightly producing a self-healing effect. The remainder of the paintwork was given a light polish using Menzerna Super Finish Plus 3800 and a Flexipads Pro-Detail Hex-Logic Black Finishing Pad with a FLEX PE14-2-150 Rotary Machine Polisher. 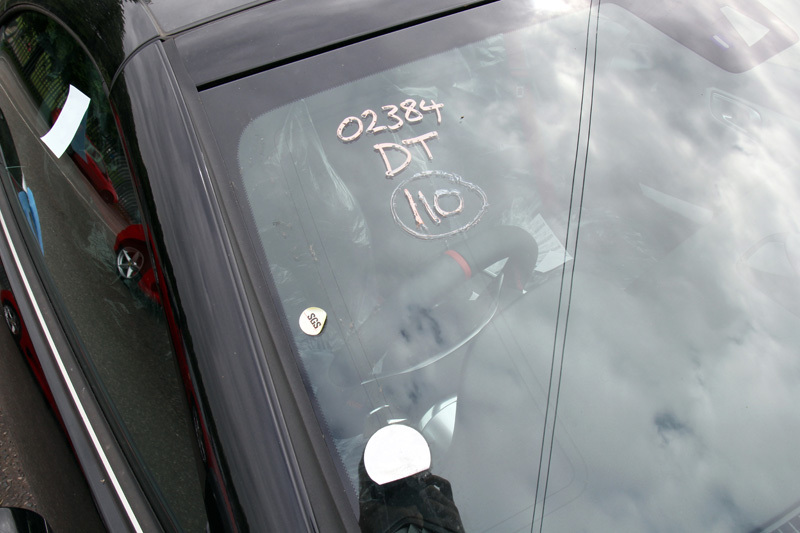 This combination was also used to remove the dealership markings on the windscreen. The paintwork now refined, it was prepared for the coatings using Gtechniq Panel Wipe, a solution which removes polish and silicone residues, leaving nothing that could interfere with the bonding of the coating to the clearcoat. Crystal Serum was then applied. After allowing to harden in controlled temperature and humidity for around three hours, a top coat of EXO v3 was applied. Whilst it was curing, the glass was coated with Gtechniq G1 ClearVision Smart Glass. This hydrophobic coating repels rainwater, snow and ice, making driving easier and less tiring during bad weather conditions. 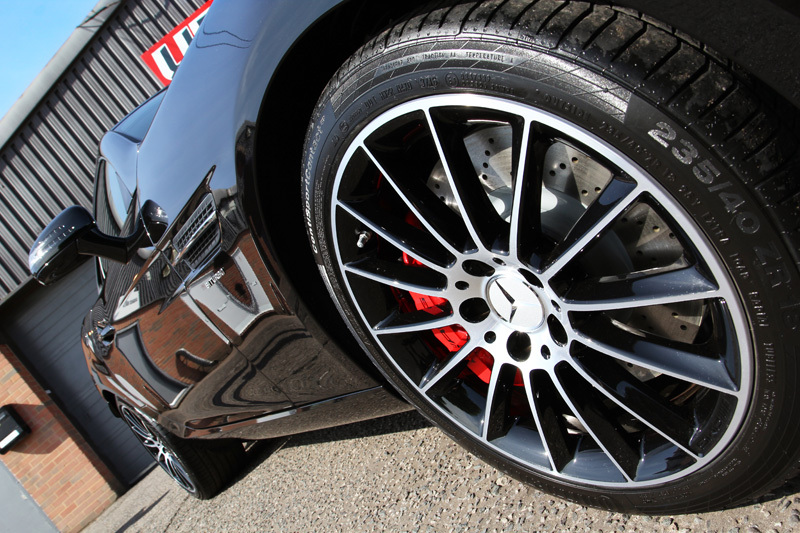 The 10-spoke alloy wheels were protected using Gtechniq C5 Alloy Wheel Armour. This forms a non-stick barrier, inhibiting brake dust build-up, repelling dirt, water and oils. Being resistant to extremely high temperatures, C5 will not burn off when the wheels become hot. Finally, the tyres were dressed using Fireball UK Ultimate Tyre Coating Wax. Ultimate Tyre Coating Wax delivered a clean, gloss finish that perfectly complimented the extreme gloss and reflectivity of the paintwork!